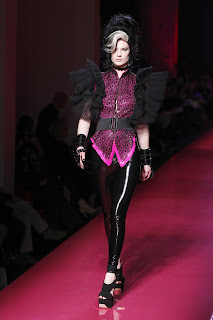 Jean Paul Gaultier, the designer who has always celebrated pop-culture paid homage to the "Back to Black" singer's retro style. 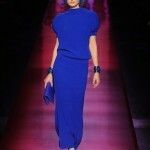 Amy Winehouse was the muse for his spring/summer 2012 couture collection at Paris Fashion Week on Wednesday the 25th. The french couturier's models took the catwalk in Winehouse's signature sky high beehive hairdo, draw on moles and cat-winged 60's eyeliner smoking cigarettes in brightly-colored 1960's classic looks of fitted pencil skirts and dresses, tight bustiers and floaty silk nighties with exposed pointy bras while a live acapella group sang Rehab in the background. Hand crafted artistry was on display, thousand pieces of embroidered glitter on a Violet-blue coat, worn over a pleated white skirt and plant green top made entirely from sequins. The models donned black veils to walk the finale. 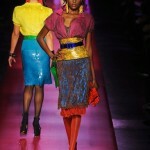 "Amy Winehouse was a true style icon," Gaultier told reporters at Paris Fashion Week calling the show a "tribute." He continued to say that "she stands for above all, uniqueness both in music and the way she dressed, she mixed a great many influences to create her style. She was an icon of fashion and truly, the sense of how she mixed the clothes - it was great." The show was not well-received by everyone. The late-singer's father, Mitch Winehouse, said he believes the show did not portray his daughter, who died at age 27 last year of a drug overdose, in the proper light. "No one asked us for permission or offered to make a donation to the foundation," Mitch Winehouse said. 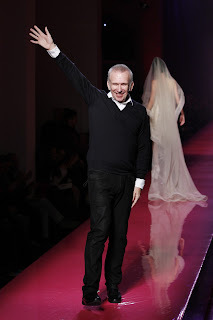 "This is purely about Gaultier making money, and that's wrong."